On the 25th of October 2013 the Minister for Local Government, Eric Pickles MP, announced a “new press freedom law to open up town halls”. (See motion 5 within Business Today: Chamber for Monday 28 October 2013). Adding the new law to a bill which is already proceeding through parliament suggests it could come into force quite quickly. On openness, we want to increase levels of transparency to make it harder for councils to make decisions out of the sight of those they serve—something hon. Members touched on this afternoon. In particular, we want the public to be able to film, blog or tweet at all meetings where they are allowed to be present. Some councils are still refusing to allow people to do this, preventing local people from using modern technology to hold their elected representatives to account. The new provisions will allow us to extend that level of openness to other council meetings, closing the loopholes that councils are using to refuse the public access. Perhaps our most significant proposal is to give people the right to film, blog or tweet at council meetings. Some councils would prefer meetings to be held behind closed doors, but the public has the right to see decisions being taken and how the money is spent. A private Member’s Bill promoted by Mrs Thatcher introduced the right to attend council meetings back in 1960, and that in turn built on a law introduced by the Liberal Government of 1908, so this is truly a coalition of minds. It is right that we should now bring her legacy up to date for the digital age. We have previously amended secondary legislation to open up councils’ executive meetings and have encouraged councils to open up their full council and committees. Many have refused, however, citing health and safety, data protection or just standing orders. Tower Hamlets said that such a change would lead to “reputational damage”. Well, yes, it probably will when people see what is going on in their council chambers. There have even been cases of the police being called to threaten bloggers with arrest. We will therefore make the necessary changes to primary legislation to allow full councils and committees to be open as well. Our argument is that the coalition Government are scrapping the top-down red tape of Whitehall inspection and micro-management. That will save taxpayers’ money and help to devolve power, but it must go hand in hand with local transparency and accountability. We must ensure an independent free press and scrutinise and challenge bad decisions by councils. Individual taxpayers and the new wave of citizen journalists must be let in to conduct their own scrutiny. Parliament’s webpage on the Local Audit and Accountability Bill states the Bill Committee will first meet on the 4th of November 2013 and will report by the 21st November 2013. The committee are currently accepting submissions of written evidence which appears to be a possible route to seek to influence the new law. This submission is in relation to the new provision covering access to meetings which the House of Commons has instructed this committee to add to the Local Audit and Accountability Bill. I would like to see a straightforward provision giving everyone a right to film, photograph, record and report on meetings, including reporting, and publishing material, live. The only restrictions I think ought apply are those which already apply to members of the public observing such as not being disruptive and having to leave if the meeting enters a private session. I would like to see a right to film, photograph, record etc. anything which a member of the public could observe if they attended the meeting in person. I would like to see the provision apply to as wide a group of public meetings as possible. In addition to local council meetings, I would like to see it apply, for example, to police and crime panels, clinical commissioning group board meetings and public meetings of partnerships involving local public bodies. I would like to see a broad definition used for “local government bodies”. The new provision ought make clear that the mere act of filming, photographing, recording or reporting a meeting cannot be deemed disruptive / disorderly. This could apply to all public meetings. The new provision must be robust enough such that public bodies cannot seek to restrict its effectiveness for example by banning the use of mobile phones, or laptops, in meetings. I have experienced the Sergeant at Mace (the officer responsible for keeping order) at my local council, Cambridge City Council, bounding up the stairs, in full regalia but without the mace, to the public gallery and ordering me not to photograph proceedings when I sought to take photograph from the gallery during a full council meeting. I have lobbied Cambridge City Council over the last few years to encourage them first to allow photographing and filming meetings, and latterly to remove some of the various restrictions they have sought, at various times, to impose on those filming or photographing proceedings. Some of the restrictions I have experienced imposed at Cambridge City Council include a ban on zooming and panning a camera, which made obtaining watchable footage challenging. The council’s rules were also interpreted by councillors and officers as requiring those filming full council meetings to leave their camera on the floor of the chamber while they sat in the public gallery. There was also, for a period, a requirement for those filming to hold a copy of the unedited footage for a period of four months. Even Cambridge City Council’s current requirements including filming being overt and notifying meeting chairs that filming is to take place can be very restrictive. I would like anyone to be able to take their phone out of their pocket and tweet, photograph and film proceedings if something of interest happens during the meeting, or if they simply want to record, and perhaps share, their experience. Even apparently minor requirements and restrictions such as to arrive early to notify the chair, or to take steps to ensure filming/recording actions are clearly overt can restrict people’s ability to spontaneously film/record and share proceedings. Journalists with integrity may not accept councillors telling them what they can, and cannot film. I would like to see unrestricted access to film and photograph what the public can see and hear council meetings in public. I think this may improve, and expand, the reporting of local government by the professional media as well as by the general public, including campaign groups. Huntingdonshire District Council has signs up at its meetings requiring mobile phones be turned off. Such a restriction would it hard for those whose phone is their only camera, mobile computer and video camera, to live tweet, photograph or film the meeting. It would be excellent in my view if the new provision in law reflected this positive and encouraging tone. There has been some debate, and disagreement, within Cambridge City Council in recent years on the filming of members of the public making contributions to meetings under the council’s public speaking rules. While filming Cambridge City Council I have experienced one occasion where a public speaker complained to the council in relation to the fact he had been filmed after the meeting; and on another occasion a meeting’s chair stated a public speaker had asked not to be filmed. Making a contribution to a council meeting as a member of the public is not something which is, or can be, done in private. It is a very public action. It is common for those making statements at such meetings to find what they say being reported, sometimes they are quoted on the front page of the printed local paper. I do not think there ought be restrictions on filming, photographing or recording members of the public contributing to meetings. I think those filming or photographing a meeting ought be free to capture all that those present in person are able to see and hear. I have experienced members of the public contributing to meetings express dismay following an order from the chair that their contribution, and the response, cannot be filmed. At another meeting I experienced someone actively move in front of my camera so that their contribution was recorded on video. I do not think there’s any need to treat contributions from the public specially in the new provision. One of the videos accompanying this article is of a radio interview I did commenting on the new law. A full transcript of this interview and a transcript of an interview after my battle to film Huntingdonshire District Council has been made available by the “New Listener” website. a list of members of the bill committee has been published along with the first two meeting dates (5th and 7th of November). One MP who’s not listed as a committee member has tweeted to say he is a member; he also revealed the existence of a further scheduled meeting on the 12th of November. Parliament’s webpages are far from clear and up to date. The amendment sheet for the committee on the 5th of November does not include a provision on filming local government bodies. When the committee met on the 5th of November they started by passing a programme motion. New clauses and new schedules are the last thing they are going to consider. They added meetings on the 12th, 19th and 21st of November. If MPs on the committee take all the time available the local government filming provisions will probably be discussed on the 21st of November. @RTaylorUK @Cook470Lynn I'm sat in the Committee right now (and have read your written submission). I may have Mike Thornton MP's place. Another issue, I didn’t raise in my submission, is the impact of recording planning and licensing hearings and the potential impact this will have on appeals. Appeals will be able to hear what actually happened during the decision making meeting. I’ve heard Cambridge City Councillors express concern about this. Often the formal written reasons agreed for a decision bear little resemblance to what appeared to be the committee’s justification for a decision. My view is greater transparency here, as in other areas, will be a good thing. You might be interested that the written evidence you submitted on the Local Audit and Accountability Bill about filming of meetings has been published on Parliament’s website. Mine was the first submission published. There are now three listed at the bottom of the committee web page; the others don’t refer to filming local government but to other matters which the bill covers. (c) to report or provide commentary on the proceedings at such a meeting, orally or in writing, so that the report or commentary is available, as the meeting takes place or later, to persons not present at the meeting. (d) about the circumstances in which persons may not carry on such activities, including for enabling a person specified in the regulations to prevent them from doing so in the circumstances specified in the regulations. (d) for the creation of offences in respect of any rights or requirements conferred or imposed by the regulations. (b) any document relating to such a body which is required by that Part or those regulations to be open to inspection. (c) section 58 of the Greater London Authority Act 1999 (application of Part 5A to the London Assembly). In its application to subsection (1), subsection (6) is to be read as if it included a reference to an executive of an authority within paragraph (a), (b) or (c) of that subsection. In its application to subsection (3), subsection (6) is to be read as if the reference in paragraph (d) to the London Assembly were to the Greater London Authority. References in this section to a committee or sub-committee of a body include any committee or sub-committee of that body to which Part 5A of the Local Government Act 1972 applies or is treated as applying. References in this section to Part 5A of the Local Government Act 1972 include a reference to that Part as it applies to the London Assembly by virtue of section 58 of the Greater London Authority Act 1999. In paragraph 4(2) of Schedule 12 to the Local Government Act 1972 (notice of meeting of principal council), for “Three clear days” substitute “Five clear days”.’. The proposal is to give power to the Secretary of State to make regulations allowing people to film, photograph and record local government meetings. The proposal as it stands would not enshrine in primary legislation the right to film, photograph and record local government meetings. I think the bill committee (and subsequently the House of Commons) ought ask to see a copy of the proposed regulations to assist it in the scrutiny of the bill. One problem with just giving the Secretary of State the power to do something is he might not do it. The clause could be strengthened by requiring the Secretary of State to make regulations allowing people to film, photograph and record local government meetings. to report … to persons not present at the meeting. It’s all but impossible to report something live online, for example via Twitter, and ensure it is only accessible to those not present at the meeting. If there is live reporting I think it has to be expected that some of those at the meeting will follow it (and perhaps interact with it and comment on it). It appears local government bodies may be required to keep records relating to stopping people filming, recording and photographing meetings. This will, if the regulations bring it it, deter bodies from making such rulings, and assist those campaigning to open up access. It also suggests, worryingly, new offences may be created in relation to filming etc. local government bodies. That sounds like an enormous unchecked power to give a minister. I don’t want to see those filming a council meeting potentially inadvertently committing obscure offenses. Perhaps the Minister proposing the law has in mind offences aimed at councillors and local government officers who seek to curtail filming, photographing and recording. It is interesting that the clause refers to filming council (and other bodies’) executives, Minister Pickles has suggested (eg. in his latest press release on the subject) that The Local Authorities (Executive Arrangements) (Meetings and Access to Information) (England) Regulations 2012 already gives a right to film council executives. As for the public bodies covered; it is a broad group, although I can’t see NHS bodies, Police and Crime Panels, joint committees of local councils, Community Safety Partnerships and others covered. The committee are currently on clause 11 out of 47; the new clause on filming is to be considered at the end. Yep as the new clauses are considered after amendments to existing ones. I too have made a submission to the Local Audit and Accountability Bill Committee yesterday (which hopefully will be published on Parliament’s website in the near future) on the subject of the new clause on filming (NC4). My evidence on New Clause 4 has been published on Parliament’s website. As the new clauses are considered after the amendments at the end, I suppose debate on new clause 4 about filming will be during the last meeting of this committee, around the 21st November. I think great care needs to be taken not to make the situation worse for those seeking to film, photograph and record those councils, like Cambridgeshire County Council which currently allow people to just take their phone out and take, and share, photos and video. Opposition MPs expressed concern about “abuse”, for example that someone could film just one member of a council during a meeting, but concluded a councillor ought accept that. Personally I’ve considered making a film of a councillor sitting in silence, reading the paper and doing a crossword, throughout a meeting – occasionally putting their hand up as directed by their party whip. The minister said the regulations would ensure councils did not deem merely filming a meeting disruptive. There was no mention of the regulations saying anything on filming members of the public making contributions to meetings. I think this is good, I don’t think there’s need to treat them specially, it ought be possible to film and photograph them.
.@BrandonLewis Plse don't make regulations requiring ppl notify councils of their intent to film where Cllrs have decided this isn't needed. @RTaylorUK @CambsCC the aim is to allow more openness for modern media inc twitter and filming, regs will reflect this. Hopefully this means he will not include a requirement to notify councils of an intent to film or photograph. Section 40 is the part on filming local government meetings. The Bill received Royal Assent on 30 January 2014. The provision on local government filming will come into force two months after that, on the 30th of March 2014. As yet ministers have not published draft regulations so it is looking as if they will not be in place, as promised. The law on filming, photographing and recording local government meetings is now in force, however ministers have failed to bring in the regulations to permit filming council meetings which minister Brandon Lewis promised the Bill committee would be introduced, and which he assured me would “allow more openness for modern media inc twitter and filming”. So, as yet we have no regulations? Are they coming? Where exactly does this leave us? There are no requirements to inform anyone of plans to photograph or film and no requirements not to film anyone (such as officers or members of the public). Quite reasonably the regulations forbid setting up equipment to film / photograph a meeting and leaving it in the room when the public are thrown out for consideration of a confidential item. The regulations will come into force once they have been through the Parliamentary process, they will require a resolution of both Houses of Parliament; there’s a very good chance that will be a formality and they’ll be nodded through. One thing there isn’t is an offence of ordering someone out of a meeting simply due to them filming or photographing; so there’s a question of how this will be enforced. Perhaps any meeting chairs ignoring the law will be considered to be committing the catch-all offence of “misconduct in public office”? In relation to another aspect of the Local Audit and Accountability Act the Department for Communities and Local Government has threatened legal action against a council for non-compliance; so perhaps that mechanism will be used here too. In relation to your question about how a breach of the regulations would be enforced, what you describe in someone being ordered to leave because of filming would be a breach of the regulations and the laws that the regulations modify. As it’s a civil matter, the person (or persons) affected could (after first writing a letter to the local government body concerned) if they didn’t get anywhere following the letter file a case in the Administrative Court (part of the Royal Courts of Justice) requesting permission for judicial review. If permission was given, then the case would be heard in front of a High Court Judge. The High Court Judge could quash the decision made and in such circumstances it would be unlikely that the local government body concerned would do it again, especially if they’d incurred large legal costs defending the claim and had been asked to pay the plaintiff’s legal costs too. Members: Adam Afriyie, Mike Crockart, Mr Jim Cunningham, Nick de Bois, Jim Fitzpatrick, Robert Flello, Mike Freer, John Healey, Kate Hoey, Susan Elan Jones, Brandon Lewis, Robert Neill, Claire Perry, Andy Sawford, David Simpson, Mrs Caroline Spelman, Craig Whittaker and Simon Wright discharged. Source: Paragraph 23 of the 12th May 2014 “Votes and Proceedings”; however the committee has not yet met, and no upcoming meeting dates are published on the committee’s webpage. the Regulations will be debated in the House [of Lords]: this will provide the Department with an opportunity to explain its intentions to Parliament, as well as to the recipients of its press releases. That the draft Openness of Local Government Bodies Regulations 2014, which were laid before this House on 3 April, in the last Session of Parliament, be approved. The Committee draws the special attention of the House to this Instrument in its First Report of 2014-15. So dealing with the new law is on MPs’ todo list but they’ve not yet got round to setting a date for considering it. Thanks for the updates, just hope there is enough parliamentary time for the bill to complete its passage before dissolution of parliament. Fingers crossed. The Joint Committee on Statutory Instruments has reported on the Draft Openness of Local Government Bodies Regulations 2014. The Committee draws the special attention of both House to these draft Regulations on the grounds that they appear to contain an unusual use of the power to make them. I disagree with this. The regulations are what I expected, and hoped for. In the view of the Committee it is fundamentally objectionable, in the absence of a compelling reason, for a new law which requires persons affected to adopt different patterns of behaviour to be brought into force before they have sufficient time to familiarise themselves with its provisions, and to make any necessary changes to their practices and procedures. My view is this isn’t a complex change; councils have known for a long time it is likely to be coming, I don’t see the problem with expediting bringing the law into force. There has already been a two month delay before the provisions under section 40 of the Local Audit and Accountability Act 2014 came into force. provisions in the draft Regulations, such as filming or recording a meeting, and recording and publishing decisions taken by officers, would have significant detrimental, costly and disproportionate effects on local councils. There are concerns the provisions will not be published before they come into force. That appears reasonable so someone needs to ensure they are available online before they come into force. If bringing them in the day after they are passed isn’t sufficient for that, then maybe waiting a clear working day would be appropriate. There is a pressing need because whilst the great majority of councils already allow persons attending an open meeting to use social and digital media for reporting the meeting, there are examples where attempts have been made to prevent such reporting to the detriment of effective local democracy and of ensuring full transparency and accountability in step with the digital world of today. For example, we understand that on the 24 April 2014 police officers were called to effect the removal from a Wigan council meeting of a councillor on the grounds that he was using social media during the meeting. It is reported that the leader of the council, Lord Peter Smith, stated that “this has been the most atrocious meeting I have seen”. Another example is that, we understand, on 16 January 2014 the police were called to a Seaford town council meeting because a person was filming the meeting; they asked to speak to the person, who refused to leave the meeting, and the final upshot was that the meeting was abandoned. The House of Commons committee doesn’t appear yet to have a video or audio feed scheduled ParliamentLive.tv though it appears such committees have been streamed in the past so I would expect a page containing a live stream to appear. (2) Members: Gordon Birtwistle, Roberta Blackman-Woods, Mr Ronnie Campbell, Mr Tom Clarke, Ann Coffey, Mike Freer, Zac Goldsmith, Robert Jenrick, Susan Elan Jones, Pauline Latham, Brandon Lewis, Grahame M. Morris, Claire Perry, Lindsay Roy, David Simpson, Mr David Ward, Mike Weatherley and Nadhim Zahawi. House of Commons Standing Order 118 states any MP may contribute to the committee’s discussions. Minister Brandon Lewis has issued a written ministerial statement on the Openness of Local Government Bodies Regulations 2014 dated 26 June 2014 in which he announced a 28 day period between the Parliamentary approval of the regulations and them coming into force to enable local councils to bring their standing orders into line with the new requirements. We will also shortly be sending to local authorities a draft version of a new plain English guide on openness of council meetings, to explain the new rights and duties the regulations would bring. I will place a copy in the Library of the House in due course. I expect this guide may emerge in the deposited papers database. Councils or local government bodies are required to provide “reasonable facilities” to facilitate reporting. This should include space to view and hear the meeting, seats, and ideally a desk. The guidance does not clearly state, as the Minister Brandon Lewis said it does that merely recording or tweeting ought not be deemed disruptive. However there is no basis in the proposed new law for this guidance. Having guidance at odds with the law would I think be confusing. During the committee the only concern raised by an MP was about someone focusing their reporting on one individual councillor. The minister responded to say elected representatives ought expect scrutiny. Another MP sought clarity that the mayor’s routine practice of ordering mobile phones be turned off at his local council meeting (thereby prohibiting tweeting etc.) be stopped and Minister Brandon Lewis appeared to confirm it would be. Gov Minister in Lords @tinastowell said members speaking to council meetings should have right not to be filmed. Opposing draft regs then? Government stressing twice today councils won’t be required to provide laptops & cameras to those wishing to film meetings«Level of debate! Film of public meetings of local councils attracts qualified privilege in libel law anyway, unless it’s been shown to “be made with malice”. So it seems the politicians that keep going on about libel don’t seem to realise that reports of council meetings already have protections in libel law already! 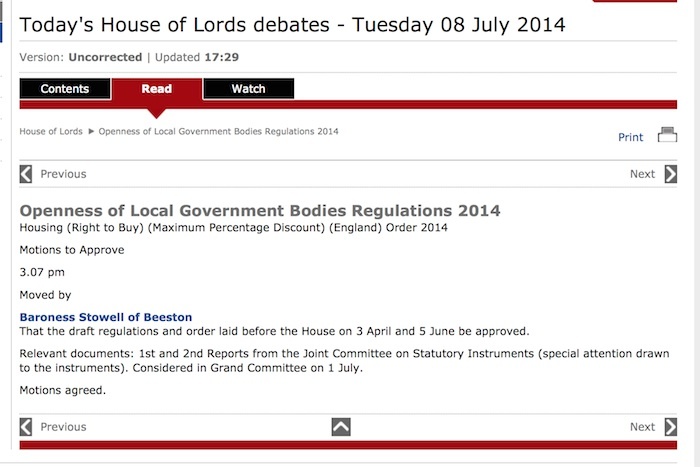 The transcript of the Lords Grand Committee on Tuesday, 1 July 2014 is now available. The council or local government body should consider adopting a policy on the filming of members of the public, such as allowing those who actively object to being filmed not to be filmed, without undermining the broader transparency of the meeting. The transcript of the session of the Fourth Delegated Legislation Committee considering the Draft Openness of Local Government Bodies Regulations 2014 is also now available. The proposed regulations have been passed unamended. 28 days later; so on the 30th of July, the new regulations will be expected to be brought into force. No, the House of Lords have to approve the regulations too which hasn’t happened yet. From what I remember that’s timetabled in the House of Lords for the 8th July, which adds another 6 days to your calculation as to when the regulations come into effect. Wonder how those councils who have been so vigorously opposed to filming/tweeting/doing anything other than reporting it for a newspaper will respond. Well the 28 days before the regulations come into effect is supposed to be so that such councils can change the parts of their constitution or standing orders that prohibit filming etc. The 28 days will also allow councils to respond to the Government’s draft guidance; and hopefully get the Government guidance in line with the law by the time the law comes in too. My Goodness, English councils cant hide any-more….. Well Done, Richard and John… great lobbying on this issue. I hope you have a drink tonight to celebrate. The above is a screenshot of the relevant excerpt from “Today’s Lords debates”; which is a temporary link, hence the screenshot. I think that makes the day we can expect the new regulations to be made August 5, 2014. I expect we’ll have to watch the Department for Communities and Local Government website on that day for the confirmation. The regulations themselves provide for them to come into force the day after they are made. I think you are right with the 5th August , but this Law firm seems to think its earlier. The author of that article was going by when the House of Commons gave approval to the regulations, however it was the House of Commons and House of Lords that need to give approval before the twenty-eight days started. Final approval was given by both but on different days. The 28 days started from the later date (House of Lords approval) therefore the regulations come into force on the 6th August, not the end of July as specified in that article. I can’t find any announcement of the new regulations being made today (5 August 2014). It’s great to see the Secretary of State did bring in the regulations on the 5th of August as expected, and they come into force the following day, the 6th. Many councils have not used the 28 days notice of the new law ministers gave them to update their constitutions, rules of procedure, websites, guidance to the public and other material to bring them in line with the new law. If I want to film Cambridge City Council from now on I will have to decide if to follow the new law, democratically set unanimously by MPs, or follow the council’s rules set by local councillors. Councillors require the chair of a meeting to be informed filming is to take place whereas the new law just allows people to film. The new law allows meetings to be filmed in full; including contributions by members of the public. Cambridge City Council and Huntingdon District Council however have local rules which enable meeting chairs to prevent filming of members of the public. Huntingdon District Council also allows chairs to prevent filming, recording and photographing meetings if such activity is deemed to “prejudice the effective operation of the meeting” and the example given in the policy is: “where it is considered that continued recording/photography/filming might infringe the rights of any individual”. The filming of children at meetings is also a contentious point. Those under 18 often play a role in meetings; for example a mayor’s cadet and a work experience student play a role at Cambridge City Council AGMs; children also on occasion address council meetings. There is still much further to go; in Cambridgeshire I’ve noticed increasingly “informal” meetings of public bodies are being held in private, or “pre-meetings” to which the public are not admitted and don’t feature on published calendars take place. I suspect often the real decisions take place at such meetings and the public meetings are just show-pieces. A major reason we often don’t get to see the real debates and decisions in council chambers is the fact many of those who vote cast their votes for members of political parties. When you vote for a political party you are voting to give power to a small group of people who generally meet and agree a position to take in private. Party members will often have agreed to vote with their party’s position prior to hearing the debate in the council chamber. The guidance doesn’t make clear the new law allows people to film, record, photograph and record all public elements of a meeting. Presumably now councils will have to advise those who object to being filmed to make their representations in alternative ways? Following the introduction of the law it is now clear to everyone that local government meetings can be filmed, recorded, photographed and reported on; so people wishing to use public speaking slots, or wishing to observe ought be prepared for such activities to occur. I think it would be useful if the central and local guidance reenforced this fact and incorrect and misleading guidance needs to be replaced. Thanks for the link Richard, like you I was invited to talk on local radio about this. However I declined. I seem to remember police and crime panels being explicitly mentioned in an earlier draft of the regulations. Here on Merseyside, the police and crime panel changed their rules of procedure at its last meeting as their existing rules of procedure put a decision about filming down to the committee being filmed (and a previous request of mine was declined). At least on Merseyside they’re under the impression that the Police and Crime Panel is covered by the new regulations. It’s a joint committee of local councils you see. Has a decision been made about filming one way or another by your local Police and Crime Panel? In case anyone is reading this from Wales, Scotland or Northern Ireland I’d better point out that the new regulations only apply to England. The first filming I’m aware of in Cambridge under the new law took place on the 18th of August 2014 at the South Area committee where both Antony Carpen and I filmed part of the proceedings. The chair Cllr Sue Birtles made a statement drawing attention to the filming and asked if anyone had any objections. No one did raise any objections when asked by the chair. Given the right to film council meetings in the new law permits filming meetings even if individuals object it would be interesting to know what Cllr Birtles would have done had anyone objected. One individual in the public seating did ask me if I would be filming the public and when I said yes (explaining the public contributions are core to the meeting, in the open forum section and for the planning items) she took a seat at the back of the room; but as can be seen from the video did not actually object to being filmed when asked by the chair. I did not notify the chair that I was going to film (as required by Cambridge City Council’s rules) as I have taken the view that the council have had time to adapt their rules following the new law coming into force but have not done so. Had councillors locally restated their local rules following the new law then perhaps I would have to reconsider how much weight to give to the local rules when making my own decisions about what, and how, to film and otherwise record, report and comment on council meetings. The first Haverhill Town Council meeting (planning committee) to have been filmed in full by a member of the public has taken place after months of campaigning. The Town Council meeting on August 12 was recorded by film maker Aaron Luccarini, 18, from Haverhill. The bit I want to point out is the filming and recording of meetings, both of this meeting and council committees as of now. There was a law change regarding filming of meetings recently and though that is to be considered by out civic affairs committee, until the item is considered by that committee I have to point out that anyone can film, tweet, blog etc. these meetings and no notice or permission from me is required. I can request and I will happily do so if necessary that filming proceedings that those who may not wish to be filmed may be stopped on polite request to the person filming but unfortunately I cannot require that person to stop filming if they do not comply with that polite request. I can of course stop recording if it disrupts the meeting itseelf. It is interesting to note that following this statement it appears Cambridge City Council has accepted the new law overrides its existing constitution which it did not take the opportunity to amend prior to the new law coming into force despite ministers giving them time for this purpose. Cambridge City Council is to review the section of its constitution relating to filming, photographing and reporting on council meetings at its Civic Affairs Committee meeting on the 17th of September 2014. The public may record ( e.g. film, audio, tweet, blog) meetings which are open to the public. The Chair of the meeting has the discretion to stop or suspend recording if in their opinion continuing to do so would disrupt proceedings at the meeting. I think the proposed text is reasonable and in-line with the law. It is not though positive and encouraging text such as that adopted by Cambridgeshire County Council. Councillors are though invited by the report to consider adding extra restrictions to filming, recording and reporting meetings which in my view would be incompatible with the law. I will urge them not to do so. Another related change proposed is to remove the requirement to warn people before they are thrown out of a meeting for disorderly conduct and to enable people to be excluded from a meeting to “prevent disorderly conduct or other misbehaviour at a meeting” before any such conduct or behaviour has occured. This is alarming and in my view not compatible with the law. At the East Area Committee on the 11th of September there was a radio reporter with dicataphone and a professional camera and two members of the public filming with camcorders. I imagine many others, councillors, and observers, less obviously had phones being used to take photographs and otherwise record and report on proceedings. This is a much greater level of reporting activity than was evident before the new law. (Though before the law some reporting eg. use of dictaphones and other equipment by professional reporters and campaigners was carried out surreptitiously and in contravention of the council’s rules).